Shrub Madness 2019 crowns a winner! Proven Winners® ColorChoice® crowns 2019 Shrub Madness winner as the world’s only plant bracket competition comes to a close for 2019. Based on the college basketball playoffs, the contest is populated with a wide variety of Proven Winners® ColorChoice® shrubs, which compete throughout the month of March for the chance to be crowned National Champion. Coming from a crowded field of 64 contenders, the competition narrows to the Floral Four, then the final two after multiple rounds of voting. 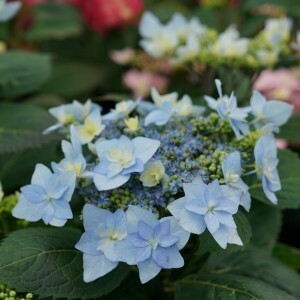 This year’s Floral Four included Pugster® Blue Buddleia, Let’s Dance® Rhythmic Blue® bigleaf hydrangea, Suñorita™ rose, and Tuff Stuff Ah-Ha® mountain hydrangea. 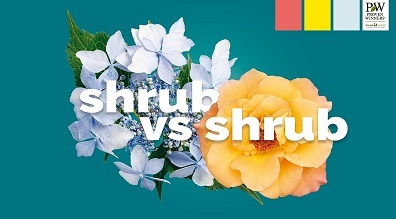 The last round of voting found Tuff Stuff Ah-Ha® hydrangea with a slim lead over challenger Suñorita™ rose, but it steadily gained traction. In the final few hours of the competition the hardy hydrangea soundly defeated the winsome rose and was ultimately crowned the 2019 Shrub Madness National Champion. Brand new to garden centers in 2019, Tuff Stuff Ah-Ha® mountain hydrangea certainly looks like a champion with huge, waterlily-like double florets. But that's only part of the story - this is also one of the most prolific reblooming hydrangeas ever seen. All summer long, it devotes its energies to creating flower buds on its new growth so that there is a constant supply of fabulous blooms from early summer through frost. Developed six years ago, Shrub Madness is one example of how Proven Winners® puts its marketing dollars to work to bring attention to its plants, and as a result, bring more customers into their local garden centers. "Shrub Madness is the perfect vehicle to find out first-hand what shrubs are most interesting gardeners this year.” Said PR specialist Natalie Carmolli, “It’s also a great way to spur some interest in newer varieties." The competition also gives folks at Proven Winners® ColorChoice® an opportunity to challenge internal preconceived notions about which plants might be most popular with the public. The additional information that is gained as a result of the contest helps to inform marketing decisions going forward. This year Shrub Madness players were once again given several opportunities to score dozens of prizes. At the end of each round, samples of top-scoring plants were awarded to participants and the player with the bracket prediction closest to the tournament’s results was awarded the grand prize “Floral Four and Plant Geek Swag Bag.” A winners list can be obtained by sending an email to the Spring Meadow marketing team.